This parlor table is very similar to a table in the “Styles of American Furniture” book on page 67. There appears to be differences in the inlay wood choices resulting in a rosier (Rosewood) color to this table. The incising patterns on the lower section vary between them, as does the number of undulations on the paw feet. The contrasting Rosewood drawer looked out of place surrounded by ebonized wood, but in comparing it to the table in the book, I confirmed that to be intentional. Even with the variations between the two, I would still not hesitate to state that the two tables were made by the same maker, which the seller, DuMouchelles, is attributing to be Pottier & Stymus. This is one of those tables that I’d love to purchase and put in a prominent, centralized location, and would be itching to put a striking vase of flowers or period statue upon it but couldn’t bring myself to risk the damage to the inlaid top which appears to be in great shape. There is one spot that appears to be a water mark on the top, but would need clarification from the seller if that was just a photo issue or truly on the table. There isn’t a single mention of any condition issues in the listing, so a prospective buyer should ask for a condition report. One can see an ebonized toe lopped off of one of the paw feet, reminding you to ask for a complete report. Bidding will start at $2,500 with expected sale range of $5,000 to $7,000. More at the listing. I sure wish that I had the proper spot for this table. Oh, Tom, having a proper spot never stopped me from buying another table. 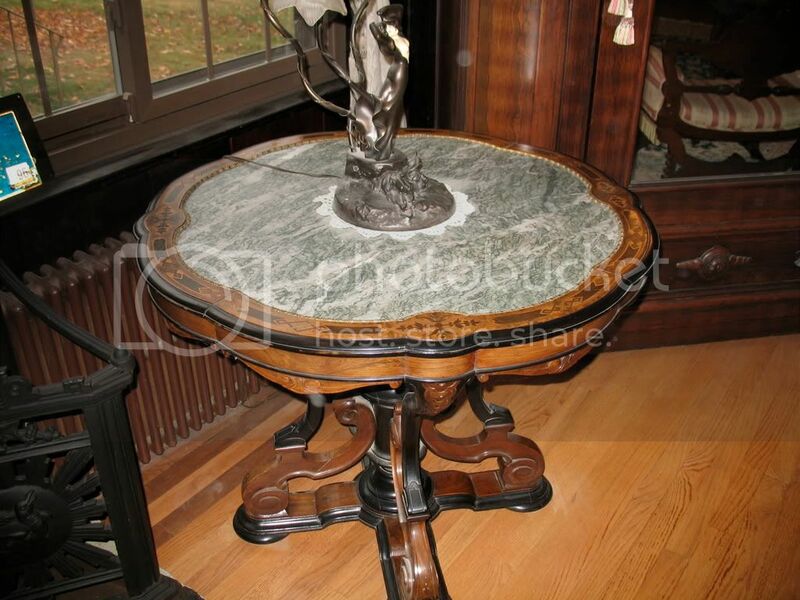 Like ice cream after dinner, there is always room for a Victorian parlor table somewhere. I’m with you John, a table like that you can always find room for. I have to wonder though, it has become common currency to attribute this form to P&S, could other makers have made them as well? They go wonderful with the neo-grec cabinets of the period and the cabinets were made by many companies. Perhaps P&S did have the market cornered on this type of table? The marquetry topped ones seem to sell for a lot more than the marble, but at least I don’t have to cover up the marquetry if i want to put something on it. Beautiful tables indeed!